Baked apple cider donuts are easy to make, but more importantly, delicious. Last weekend I was thinking about how magical it was to live in New England during the Fall, albeit only two seasons we got to enjoy, it was still one of my favorite seasons there. We would head out to the apple farm, and when we got there, we would grab cider & donuts, then make our way up and down the orchard filling our bags with delicious apples. 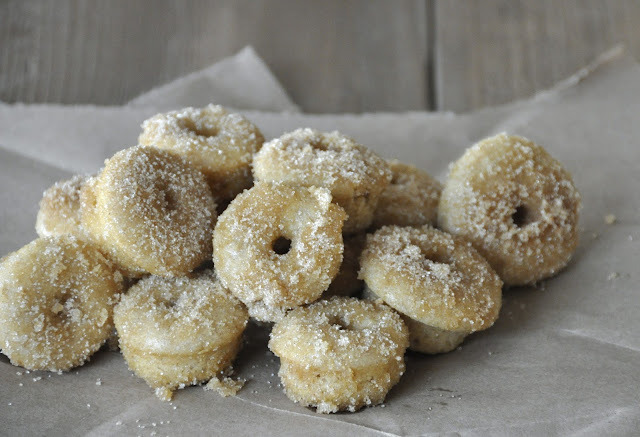 Anyway, the recipe I found was from here, and all I did different was make them mini, and crumble a donut up into my cinnamon and sugar mixture (I used a lot more of the mixture than they did) before dipping them in it. Lastly, the recipe calls for cider, I made my own using this recipe. For those that make them, enjoy! Thanks for the recipe link.